AUGUSTA, Ga. — Augusta National Golf Club is facing a threat from the one force it can’t control: the weather. As a precaution, Sunday’s final round tee times have been moved up. 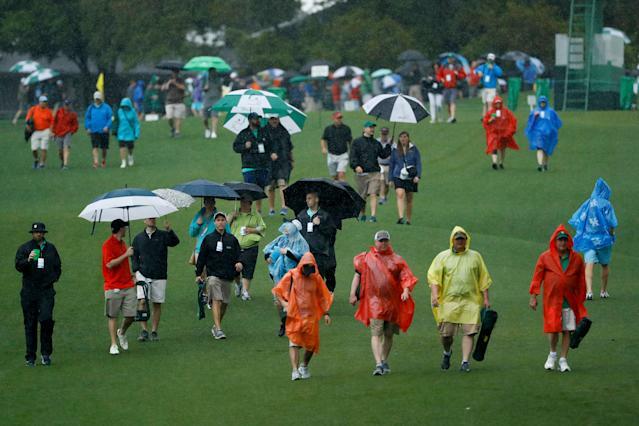 After an on-and-off weather week that saw several course closures due to rain, the Masters is facing its doomsday scenario: thunderstorms on Sunday afternoon. The Masters may not begin until the second nine on Sunday, but if there’s thunder, it might not begin at all. Current forecasts call for rain to roll in around 3 p.m., with thunderstorms slated to hit about 5 p.m. Given that the leaders generally start their final rounds around 2:30 to 2:45 p.m., this presents something of a problem. Also an issue: the fact that this year’s post-cut field is one of the largest ever, with 65 players making the cut. That’s a lot of golfers to route through 18 holes, even if many of them are out of contention. The Masters and CBS would love to avoid a Monday finish, since viewership would crater. There hasn’t been a Monday finish since 1983. To avoid that: Sunday’s round will begin at 7:30 a.m. ET, with the leaders teeing off at 9:20. Players will be grouped in threesomes, with a split-tee start — the first time this has happened in the final round in tournament history — where half the field will start on the first hole, and the other half on the 10th. To give the proper framing to the winner, the leaders will get the first tee and those out of contention starting on the 10th. CBS will begin its broadcast at 9 a.m.
Masters Sunday is always one of the finest days in sports. This year, though, you might have to get up a little early to catch it.